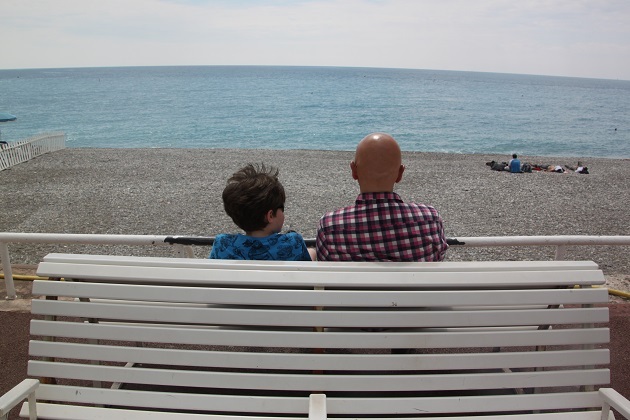 A stroll by the sea along the Promenade des Anglais in Nice is one of the things they say you have to do. Not arguing with conventional wisdom, we hopped off our hop on/off tour bus at this point, found a bench and just sat for a while looking over the beach and watching the comings and goings. It is a lovely place for a stroll, not busy at all when we were there so wandering along this wide pavement by the sea was extremely pleasant. In 1822 the orange crop of Nice was terrible and a lean time apparently for the workers. The English residents employed them to build this wide boulevard, hence the name. It stretches for over 4 miles around the bay and has been the favoured stroll of fashionable folk ever since. There are great views over the sea and the beach but I especially loved the ornate exterior of the Hotel Negresco on the other side of the street. All pastel shades and very fancy they say it looks like a wedding cake. Son however was more intrigued by the doormen dressed in shorts and black tights – something he found especially comical. All the way along the boulevard are cafes and lots of people heading for the mainly private stretches of beach. No sand here, just pebbles and not particularly tiny ones either. Apparently a few private beaches have added a layer of sand but most looked to me to be a stony experience. We walked all the way along the Promenade and around to the Vieux Port. Stunning views here too, lots of restaurants, lots of boats and ferries departing for Corsica. 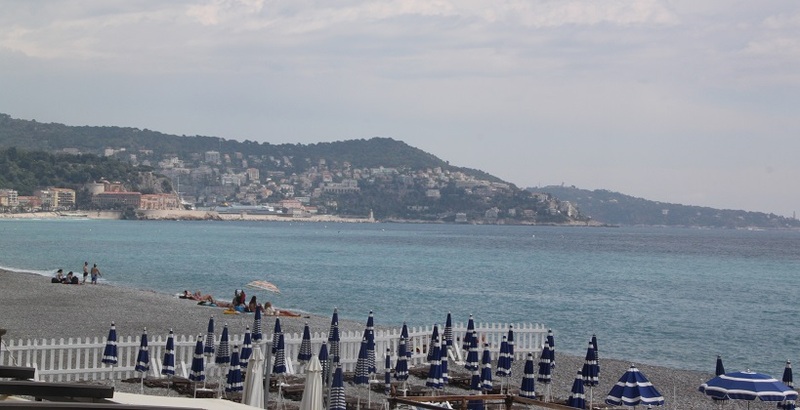 I remember the first time I visited Nice, and I was gutted to see it was a pebbly beach having pictured it in my head as a nice, big sandy beach! 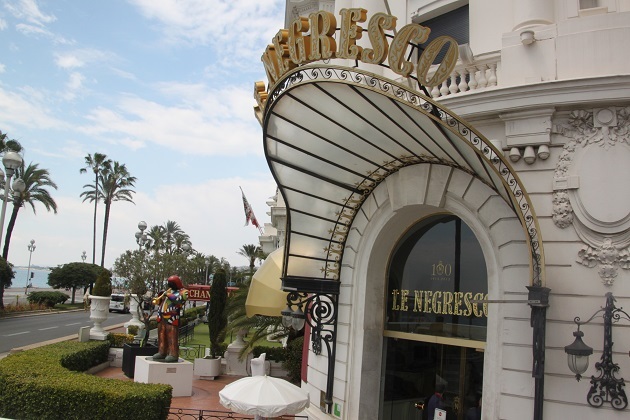 My family had a drink in Le Negresco as my dad wanted to see inside – it’s just as elaborate as the outside would have you believe, a gorgeous building. That’s my regret that we didn’t go inside the Negresco – I really wanted to see what it was like as well but we were under time pressure – next time! Luckily when living in Europe places are so close that there can always be a “next time”! A great people watching place and seemingly timeless. Wonderful! The people watching is just wonderful George – one of my favourite things to do anyway but here there is so much to observe! Isn’t it wonderful Pam – I just wish we had peeked inside that wonderful hotel to see what the interior was like!! 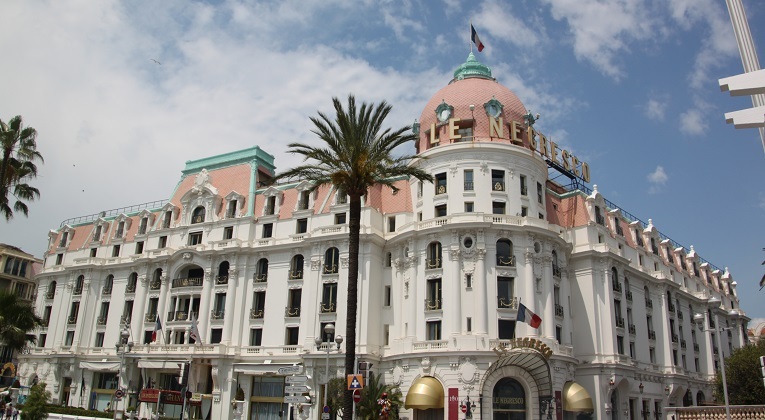 A lovely look along the Promenade des Anglais – I remember the Hotel Negresco, it looks so beautiful but we didn’t venture inside. 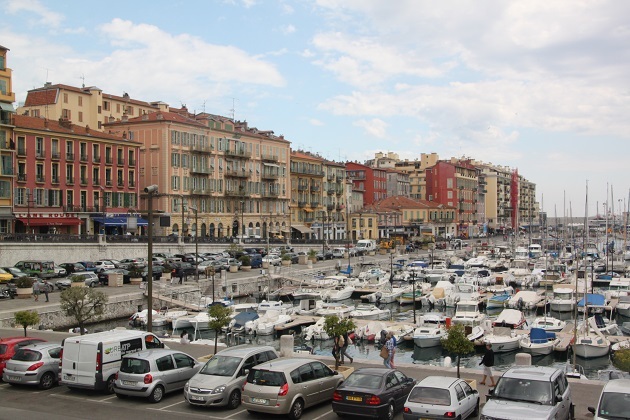 The old port is my favourite part of town, so much to see with the ferris, small boats, little shops and cafes. I’m pleased you enjoyed your visit here. We didn’t go inside the Negresco either but I wish now that we had – curious to see if the inside matches the exterior, I’m sure it does!! We loved the port too, so much to see and all the comings and goings, I could have stayed there for hours. Ahhh, brings back beautiful memories. 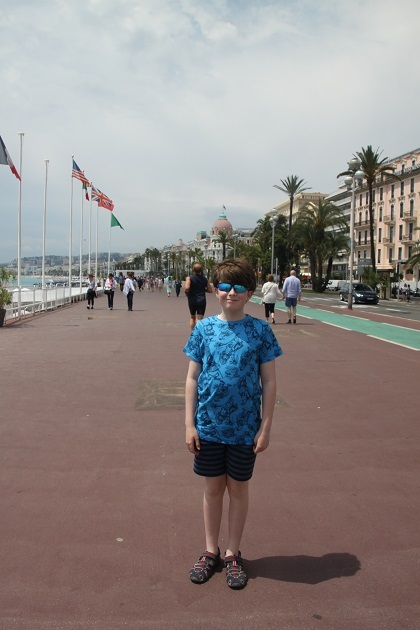 Strolling along the promenade in Nice… what could be better!! This looks fabulous! 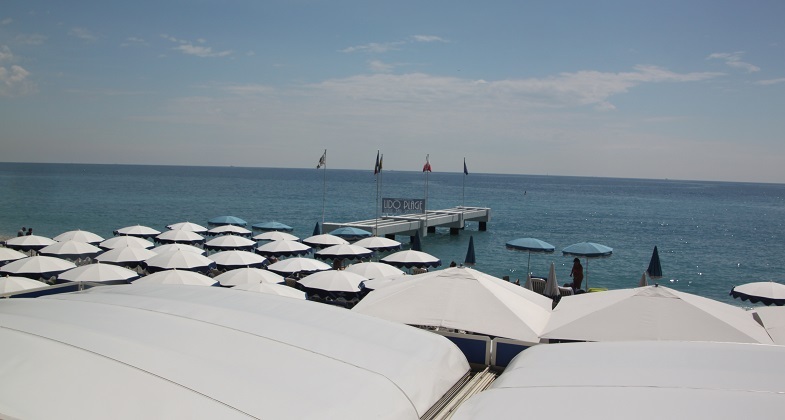 I especially like the photo with all the blue and white umbrellas and chairs–wish I was sitting right there! Me too Kerry – a cold drink in hand looking out over the sea with the sun shining sounds just perfect to me right now! Actually to be honest I’m not too keen on sand anyway – pebbles probably better for me!! Love how you “take” me there with your words and photos. You’re welcome. It’s a joy to see your travels! Oops. That was totally accidental. Looks good, I must put this part of France on my ‘to do list’. Where to next? Greek Islands for me and then Malta at half term! Sounds great – went to the Greek Islands 20 years ago, always been in the plan to go back sometime but never quite made it (yet)!! Malta is somewhere we’ve never been but I fancy a trip there too – looking forward to your take on them both Andrew. 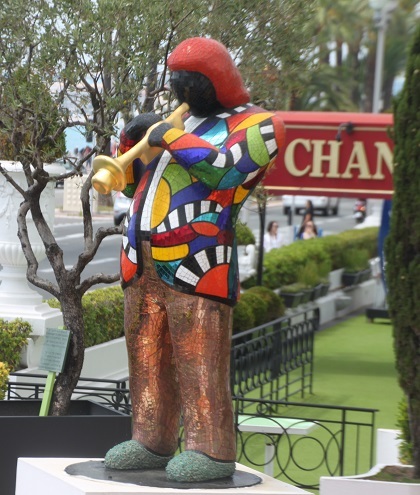 Great photos and highlight of Nice. Thank you – the promenade and views over the sea in this part of the city are gorgeous. 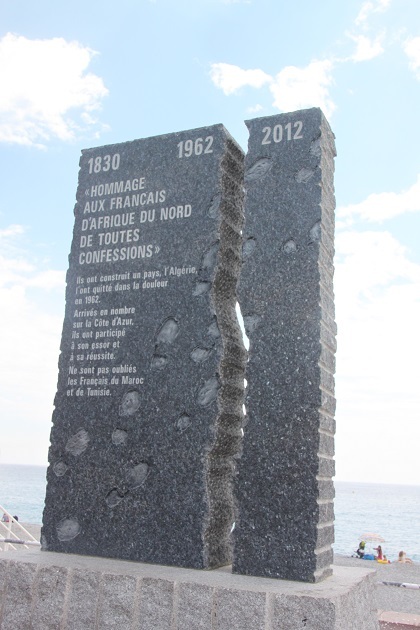 It is 25 years ago that I have been to Nice. Thank for the lovely memory! It probably hasn’t changed too much Erika – a great thing as it’s a wonderful city. I love the photos of the beach umbrellas! They attracted my attention, just waiting for the people to arrive!! Absolutely Shirley, we do those have those “remember when” conversations plenty already. We love travelling with him, it gives you a whole new perspective on things. I have just booked a Flight from Australia to UK/Europe next year so am very excited about that. Not sure where you live! S.
Sounds like something to really look forward to – now the planning can start!! We live in the UK – England! Looks like your stroll there was a bit more relaxing the ours when our daughter was 1😉. Back then I was disappointed to see the famous rivieras are full of pebbles but our daughter loved playing with them. There’s something about pebbles though – our son always loved a pebble beach (still does)! I can’t relate to pebble beaches, but have always wanted to experience a French or English pebble beach. Sand is all I know. 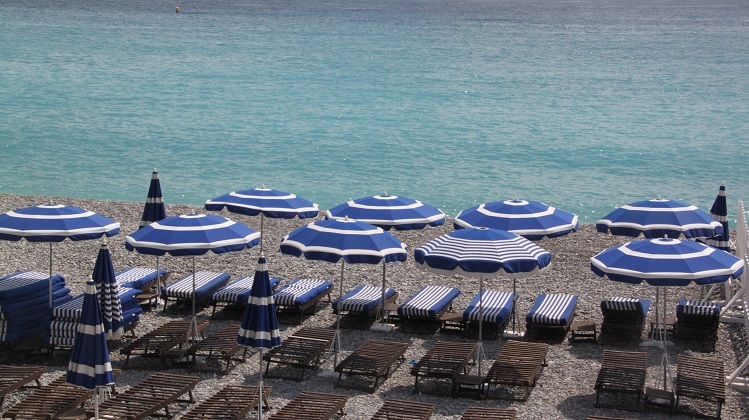 The umbrellas white and blue are tres magnifique! I have longed for the south of France for many years. I hope to make there before I’m too old and feeble to get there. Merci beaucoup pour le tour! Oh it’s a wonderful place to visit, so many lovely places on the coast and the wonderful little villages away from all the hustle and bustle too – I hope you do get there soon!! Pebble beaches are not to all tastes but I do love them – something different! So that was the beach Rosemary – not surprised it stuck in your memory!! The hotel looked so unusual and lovely from the outside, I’m just kicking myself now that we didn’t venture inside for a drink, would have loved to see the interior too. Must look out that Michael Portillo episode – thanks for the tip!! Thanks Rosemary, definitely going to check that out! Love his jackets and ties – I know it annoys some people but I feel he really gets into the spirit of a bygone era! I remember walking along the beach in Nice in my 20’s as a backpacker and it wasn’t crowded then either – nice to know that’s still true! I just didn’t expect that so it was extra nice to be strolling without vast crowds! 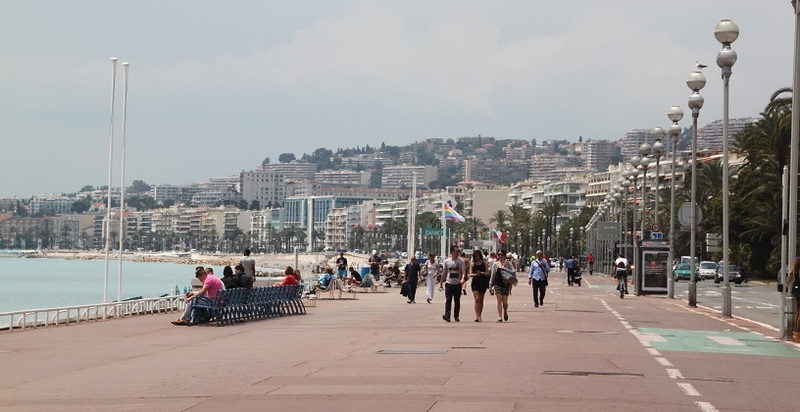 I didn’t know the origin of the name “la promenade des Anglais”, I’ve learnt something ! I liked the story and it stuck in my head! Ahhh I would love to lounge on the beach in Nice! Although I’m a little sad to discover there isn’t sand but large pebbles! Oh well, I’d handle it just to go! Yes no sand whatsoever but the beaches are still lovely and some great views. I wanted to thank you for checking out “The Adventure Begins” on my StruckByWanderlustBlog.wordpress.com. It’s very much appreciated ! We loved it – so vibrant and beautiful.